Carolers will start at the location most convenient to them. Once they finish their route, they will travel to 633 Parkview for an after-party. The Heights Park Holiday Sing and Stroll is almost here! Before we gather at 5:30 p.m. on Sunday, Dec. 3, here are some details about the fun evening of caroling door-to-door. 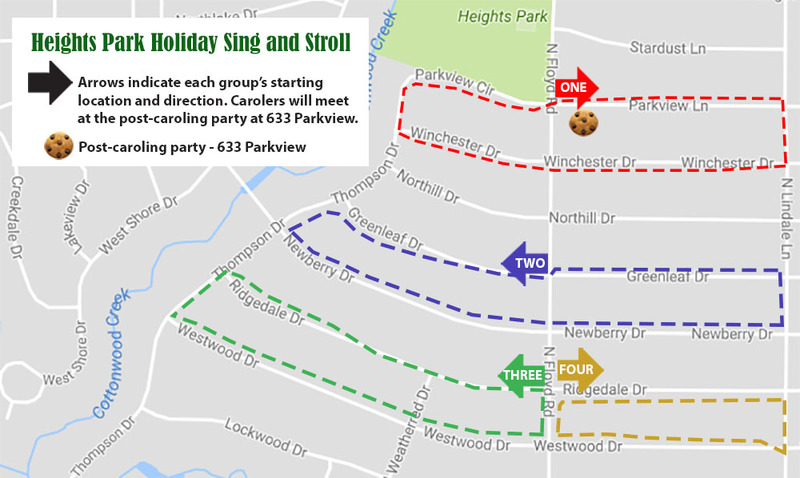 Carolers will meet at one of four designated locations (see information at the bottom). Carolers must arrive at the location most convenient to them by 5:30. Ideally, each group will have approximately 10 people. Songbooks will be provided. Carolers are encouraged to bring flashlights (it will be dark) and strollers/wagons for little ones. If you want to participate in the Holiday Sing and Stroll, email contact@heightspark.com. After caroling, all singers are invited to a festive after-party at the home of HPNA president Janet DePuy, 633 Parkview by 7 p.m. There will be hot chocolate, cookies and other warm beverages. Carolers are encouraged to drop off a treat to share at Janet’s house by 4 p.m. Sunday. West on Winchester to Thompson. North on Thompson to Parkview and proceed to 633 Parkview for after-party. Proceed west on Greenleaf to Thompson. East on Newberry to Lindale. North on Lindale to Greenleaf. West on Greenleaf to Floyd and then to 633 Parkview for after-party. Proceed west on Ridgedale to Thompson. South on Thompson to Westwood. North on Floyd and then to 633 Parkview for after-party. Proceed east on Ridgedale to Lindale. South on Lindale to Westwood. West on Westwood to Floyd and then to 633 Parkview for after-party. 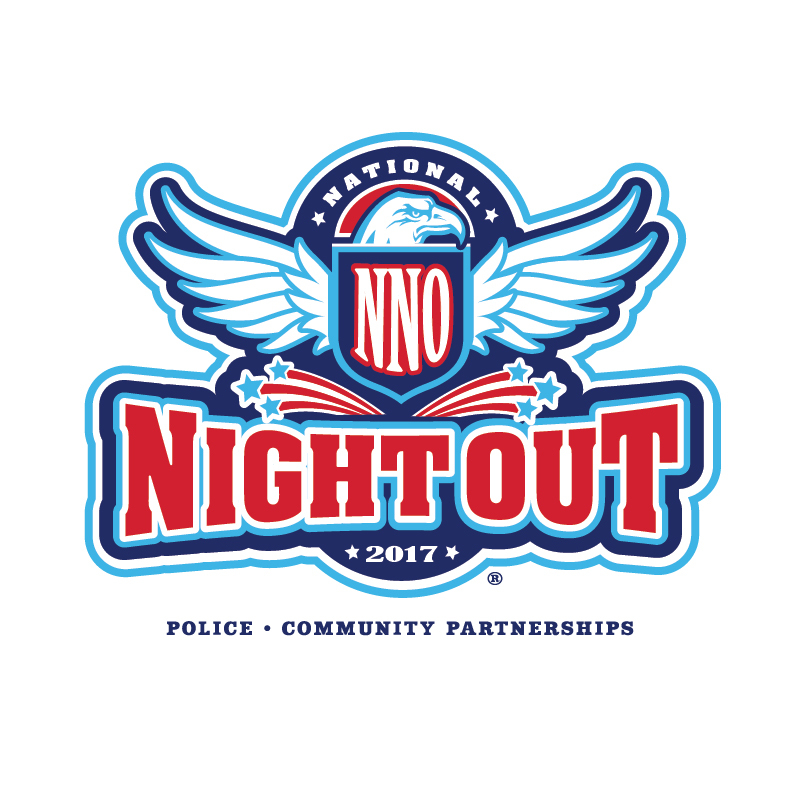 The City of Richardson recently announced its National Night Out winners. We are pleased to share that one block in Heights Park was recognized. The 500 block of Twilight Trail received honorable mention. Congratulations to this block for another great NNO event! It’s held at the home of Herb and Nanci DuPlant, 530 Twilight Trail. Each block that participated in National Night Out on Oct. 3 was judged on attendance, crime prevention message, food, decorations and activities. In addition, the Richardson Police Department collected more than 5,200 pounds of canned food during their “Can Do” food drive held in conjunction with NNO, benefitting Network of Community Ministries. The popular summer academy for kids is currently not accepting applications. But you can learn more about it on the city’s website. 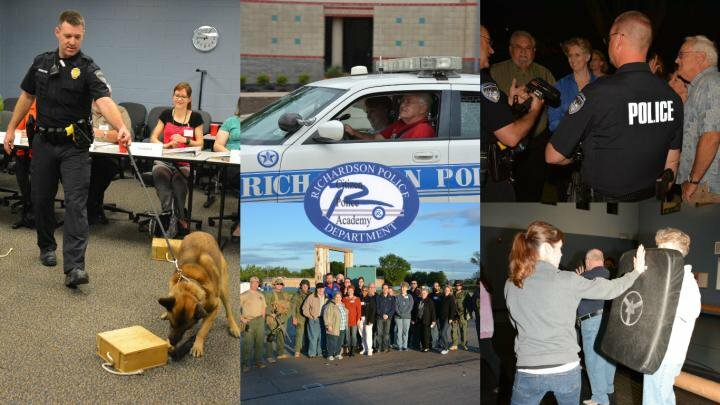 The deadline to apply for Richardson Citizen Police Academy (CPA) is Dec. 4. CPA is a 45-hour academic course designed to give Richardson residents a working knowledge of the Richardson Police Department. Classes are designed to be interactive and fun with an emphasis on team building. Students will participate in a mock SWAT raid, test their skills on the department’s driving course and have the opportunity to fire police weapons. One class — the popular Drive-n-Shoo — is held on Saturday. CPA is free to participants. Academy class size is limited to 20 participants. There is one academy per year. A graduation ceremony is held during the final week. The goal of CPA is to strengthen the partnership between the police department and the community. It allows residents a view of the inner workings of the department in an academic environment where ideas are openly exchanged in an effort to increase community solidarity. CPA also allows the department to be more aware of individual concerns and perceptions so it can be more responsive to future community needs. For more information, please contact the Crime Prevention Unit at 972-744-4955. Neighbors are encouraged to spread the ho, ho, holiday spirit and cheer through Heights Parks’ two winter traditions — Spiral Tree Displays and the Holiday Sing and Stroll. 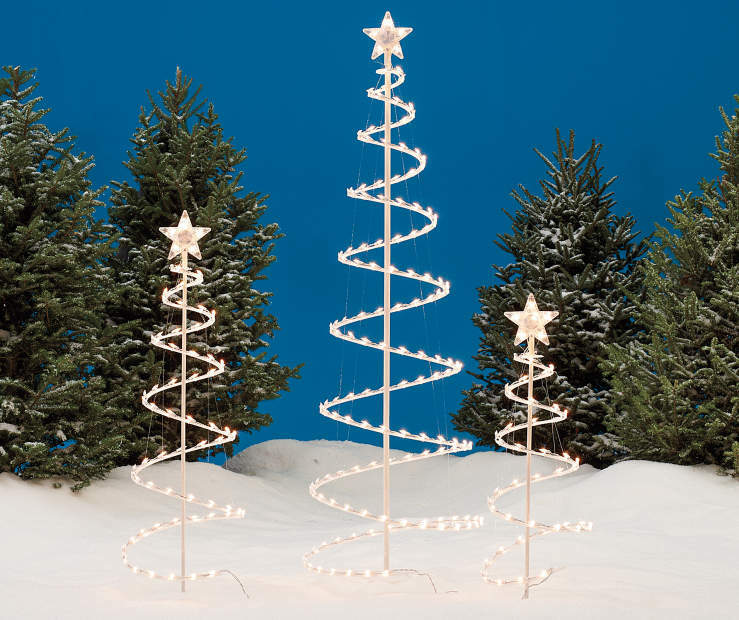 Saturday, Dec. 2 is the day neighbors are encouraged to put out spiral trees in their yards. It is quite a sight at night when the blocks are aglow with row upon row of these trees. If you need a tree, they are available at stores and online — Big Lots, Target, Sears, etc. — for about $30. The next night, Sunday, Dec. 3 at 5:30 p.m., carolers of all ages and talents will go door-to-door (amid the plentiful spiral trees) to sing songs of the season. Songbooks will be provided; additional details are forthcoming. If you are interested in caroling, email contact@heightspark.com. Important: We need a caroling coordinator for the Holiday Sing and Stroll. This volunteer will organize carolers and plan routes. For more information, email contact@heightspark.com. 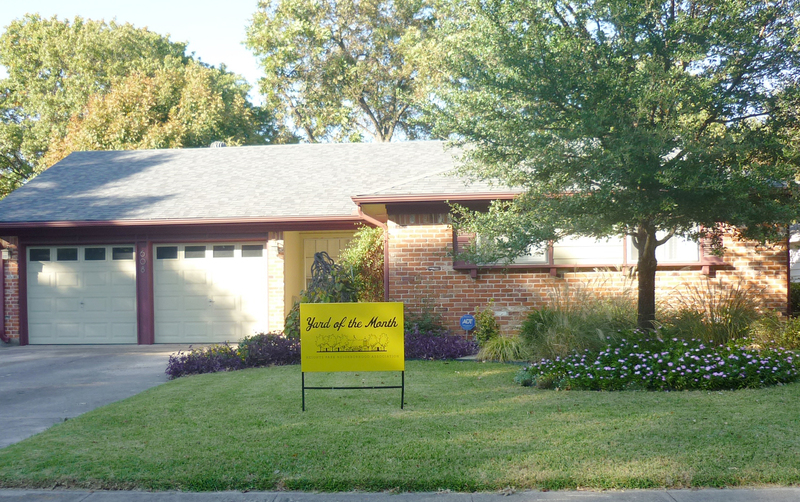 We appreciate so much the recognition by our neighbors for Yard of the Month. We moved to Heights Park neighborhood in 2004 after a year searching in Dallas for a place that “felt right.” We drove by a Realtor (Janet DePuy, HPNA president) placing an open house sign at the corner of Belt Line and Floyd and we told her what we were looking for and she motioned us in! Once we discovered Heights Park, we knew we were home. Little did we know how many neighbors we would encounter that had connections along the path that led us here. Our garden, like so many others, has been a progress of trial and error. The property had a row of red tip photinia along the front foundation and an elderly Bradford pear as the lone front specimens. Those passed early. Several foundation plantings came and went. But the anchor — a weeping red bud we planted at the front entrance in 2004 — gets the most questions. It was complemented by a weeping lace leaf Japanese maple, which did not survive the loss of the big trees that shaded it. We added flagstone to add interest and widen the access along the drive. After the demise of the Bradford pear, we planted the live oak in the front. The neighborhood had so many old oaks but many were starting to disappear; so it seemed proper to put one back. That led to the current garden setting. With input from neighbor Bob Vinson, cofounder of Nativ Landscapes, we devised a planting that focused on free form and organic flow. We wanted to have color and interest but retain the feel of a spot in nature. Annual color for us seems best accomplished with zinnias or periwinkles. The chrysanthemums began as a basket on the porch back in 2004. One just keeps digging and dividing. In the back yard, there is a collection of family heirloom seeds and cutting from my grandmother’s gardens. They are under constant development until they find a comfortable spot in the garden. We really enjoy the small-town home feel in the big-time city! Thank you!